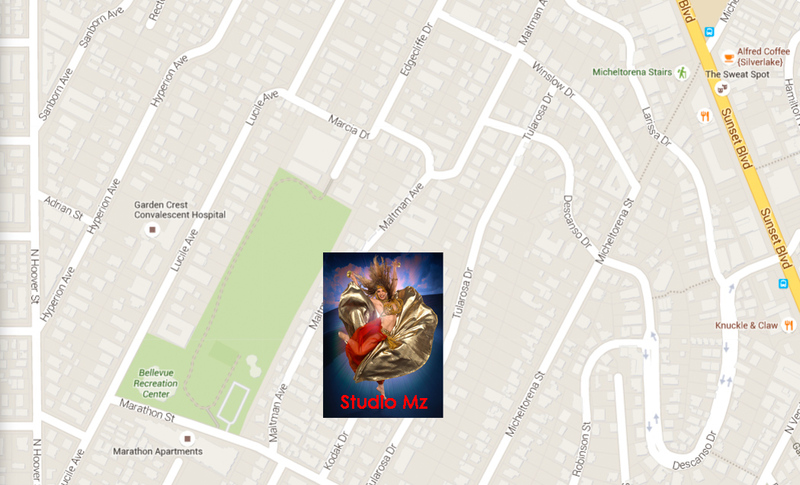 All Classes held at Studio "Mz" in Silverlake unless otherwise noted. Classes are on going. Drop-in students welcome. with Finger Cymbals & Veil! Buy your 5 Class Dance Card HERE! Most importantly, wear something comfortable to move in (no jeans or mini-skirts). Wear work-out clothes, yoga pants, or a skirt and top. A scarf tied at your hips is a simply way to spice things up. Adding a coin belt adds sound and helps you see and feel your hip movements. Once you come to class, you’ll get more ideas of what to wear. Some dancers like to dress up while others keep it simple. DO I NEED ANY SPECIAL “EQUIPMENT”? I teach Bellydance with Veils and Finger Cymbals, so if you have them, bring them! If you don't have them, you'll find a few are available to borrow in class. There are many colors available plus new sets of finger cymbals for purchase in class or at www.mesmera.com.